Although wooden chairs come in several shapes, designs and styles, a simple and functional wooden chair is fun to make and a great introduction to more advanced wood furniture projects. 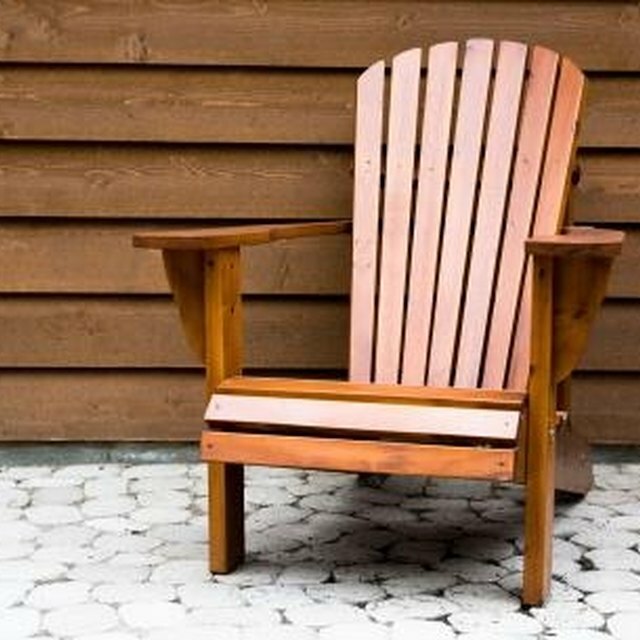 Simple chairs may be constructed of pine or fur, and wood screws--common materials that can be found in most home centers. Making your own wooden chairs is simple, practicle and very affordable. Place the 2 1/2-inch-by-18-inch back rest rails on your work table 22 inches apart. Overlay vertically and screw in six 2-inch-by-24-inch-by-1/2-inch back rest wood slats 1 inch apart, starting from the top of the rails, and set aside when finished. Place two 1/2-inch-by-14-inch seat rails on your work table 22 inches apart. Overlay and screw in six 2-inch-by-24-inch-by-1/2-inch seat rest slats, and set aside. Attach the two 1/2-inch-by-16-inch front legs, 14 inches from the leg bottom, to either side of the seat rails with screws. Attach the two 1/2-inch-by-16 1/2-inch back legs, 14 inches from the leg bottom, to either side of the opposite end of the seat rails with screws. Attach the back rest to the back legs with screws. Attach with screws two 1/2-inch-by-16-inch arm rests to the outer sides of the back rest, and to the top of the front legs. Use a saw to shave off the length of the feet so the chair will balance without wobbling. Based in Seattle, Dino Lencioni has been writing advertising copy, plays, radio and film scripts since 1999. He has written for websites such as Amazon.com and drugstore.com and has written and directed two independent films: "Father Prester" and "Down A Dirt Road." Lencioni earned his Bachelor of Arts in English literature from the University of Washington.